Vihari scores maiden test fifty. India were 174/6 overnight trailing by 158 runs with only 4 wickets in hand. It looked as if the hosts would wrap up the opposition and would run away with the game on the morning of Day 3 of the Oval Test but two Indian batsmen had different plans. India are now 240/7 at Lunch courtesy a valiant fight put in by two players who were drafted into the XI for the first time this tour. 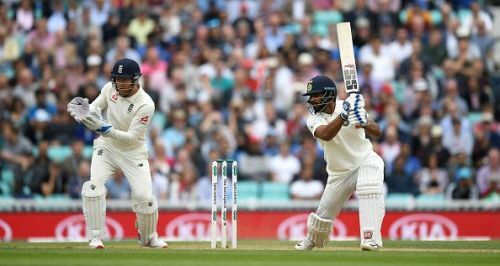 Ravindra Jadeja and Hanuma Vihari walked in at the crease with the conditions at Oval still swing-friendly but they showed great temperament in countering spells of both Anderson and Broad. The English swing stalwarts moved the ball both the ways but couldn't reap any rewards for both Jadeja and Vihari had put a big value on their wicket. While Jadeja was cautious and refrained from flirting with deliveries outside the off stump, Vihari played as close to his body as he could and showed great technique for someone who's playing his first match in such conditions. In the process, Hanuma Vihari reached his maiden Test fifty on his debut match and that it came against a threatening pace attack in swinging conditions when his team looked down and out makes every run he scored more special to him and his team. However, Moeen Ali finally got the better of him getting him out just before Tea on 56 (124) when Vihari nicked one behind. Vihari reviewed but the decision stayed. There was an appeal for caught behind for Jadeja too for which the England captain went upstairs. But there was clear distance between bat and ball which cost England a review. Now, it's up to Jadeja and the rest to minus as much deficit as they can. India is still trailing by 92 runs. Jadeja is currently batting on 41 with Ishant Sharma on 1.